4300 cases of kidnapping and confinement have been conducted against Unification Church members in the last 44 years since 1966. Forced attempted conversion is usually performed in a closed environment. Doors and windows are double or triple locked and all contact with anyone out-side of the confinement site is strictly prohibited. Family relationships are destroyed. The victim’s personality is severely damaged. Many cases report that the victim suffers from PTSD for years after release. Destroyed family trust is not easy to restore. A few victims have stood strong to eliminate this crime. Yet, there hasn’t been even a single case that the judicial authority has indicted. The criminals remain free to continue these most destructive acts and, even now, some members are being confined even at this very moment. Many booklets and brochures have been published and a web page has been created in order to let many people know about this terrifying reality. Those reports and articles have been re-edited and published in one book. The project started last autumn and on July 15 Kenjinshya published the book. It contains detailed and painstaking reports about the tragic reality of victims who were confined in a mental hospital. Exposed are activities of some teams of Christian ministers and lawyers who conduct faith breaking as a business and pull the strings behind the scenes. Also, brought to the surface is the inappropriate and biased response of police and secret maneuvers of communists. 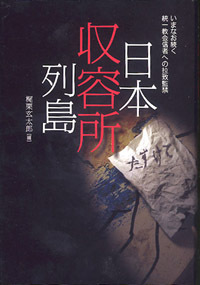 A reporter, Kazuhiro Yonemoto, interviewed Mr. Toru Goto, the chairman of “The Japanese Victims' Association Against Religious Kidnapping and Forced Conversion.” This interview is included as well as a brief report about the international approach aiming to eliminate forced conversion is at the end of the book. We hope it will help you to understand the reality of the “kidnapping and confinement” that has been happening throughout Japan and we urge you to support our plea for help to solve this issue.